Whether you need AC repair, heating repair services or just preventative maintenance to prevent future problems, we’ve got you covered! We are dedicated to providing exceptional service at an affordable price. A lot of people struggle with broken HVAC units during the summer and have to wait days before it’s fixed and left with a heavy bill, BUT THEY DON’T HAVE TO. A lot of people struggle with broken HVAC units during the summer and have to wait days before it’s fixed and left with a heavy bill, BUT THEY DON’T HAVE TO. Austex Air offers Preventive Maintenance contracts that get ahead of your HVAC before it gets ahead of you. Nothing is worse than coming home from a long day of work to an overheated house, then having to wait days before its fix; often times left with a heavy bill. HVAC replacement cost is not as bad as you may think. 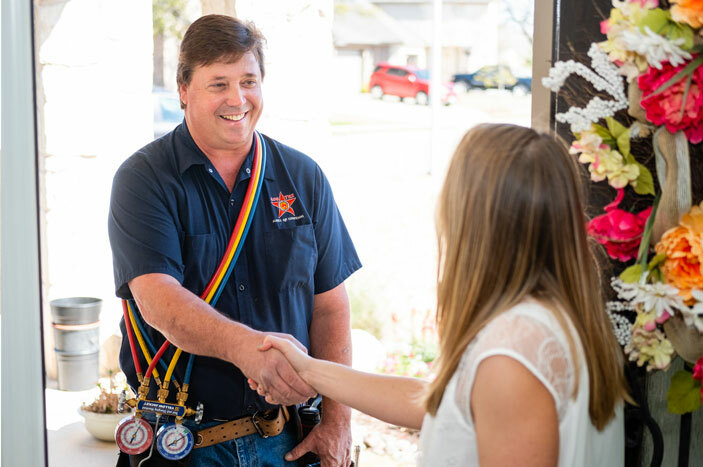 Austex Heating and Air prides itself on providing their customers with upfront pricing, guaranteed top-quality products & professional service technicians. We fix broken HVAC units that promise day and night AC for the comfort of your family. Servicing the greater Austin area, including Cedar Park, Georgetown, Leander, Pflugerville, and Round Rock. Knowledgable, helpful, patient, hardworking, and honest. These guys are class A. We love our new system! Thank you AusTex! Spoke to Dave. Came in the next day, gave quote and replaced my broken A/C the same day. Very resonableprice and great customer service. What great service! I had a simple issue, drain line was clogged so drip pan was filling. Talked to AusTex over the phone, game me some tips to try and fix it myself. Thanks to Austex for your time and advice. I highly recommend AusTex to anyone needing AC repair. Good honest folks there for sure. Austex AC Services is your air filtration and purification specialists locally in Cedar Park and Austin Texas area. In order to reduce maintenance and operating costs of your equipment and to provide the level of cleanliness required, quality air filtration is a must. Up-Front pricing is to know the cost of repairs before work has begun. Our technician will show up for a minimal trip charge. He will diagnose the problem and present you with a total cost of repairs. The trip charge will be included with the total cost of repairs. If you decide to decline the repair work only the trip charge will be due. Proactive care to prevent future problems.